LOS ANGELES (AP) — The postgame roars from Notre Dame’s locker room echoed right through the Coliseum’s thick cement walls and metal beams Saturday night, moving around the 89-year-old arena like a long-absent force of nature. After decades away, the Fighting Irish are back on top of college football — unmatched in the rankings, unblemished in the standings, and unequivocally ready for a chance to end a 24-year national championship drought. Manti Te’o, the star linebacker from Hawaii who led this improbable revival season, took a moment to listen to those echoes. “This is where you want to be when you go to Notre Dame,” he said. The Irish are No. 1 again — a Golden Dome atop their sport. 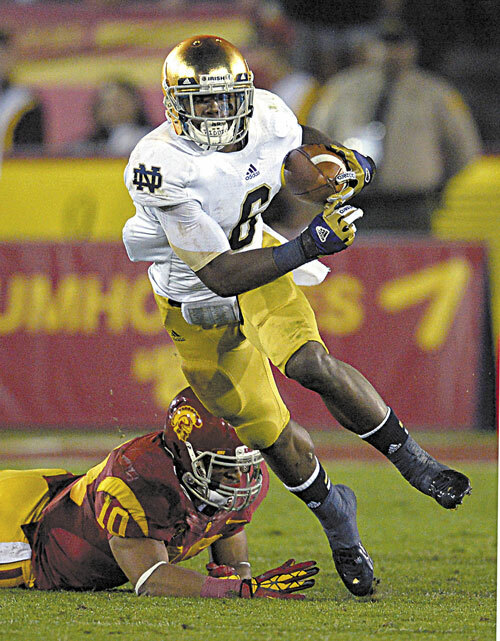 Notre Dame (12-0) beat Southern California 22-13 to complete its first unbeaten regular season since 1988. That’s also the last championship year for the school that produced a legion of the sport’s most memorable figures: Knute Rockne, the Four Horsemen, Paul Hornung, Joe Montana — heck, even Rudy Ruettiger. A no-nonsense win over Notre Dame’s intersectional rivals in Los Angeles capped a year of historic dominance for a defense led by Te’o, its inspirational Heisman contender. That defense allowed just nine touchdowns all season long, capped by four downs of unyielding play while backed up to its goal line by the Trojans in the final minutes. “You just put the ball down in front of us, and if there’s time on the clock, we’re never going to give up,” defensive end Kapron Lewis-Moore said. These Irish never flinched, either in dire late-game circumstances or under the weight of history that has crushed decades of previous Notre Dame teams. After beginning the year unranked and projected for maybe eight victories by optimistic pundits, the Irish produced a marvelous season of old-fashioned, hard-nosed football amid the wacky spread offenses and garish neon uniforms that seem to dominate the sport these days. After winning half of their games by nine points or fewer, including two hair-raising escapes in overtime, it’s clear these Irish have something else going for them as well. The Irish have six weeks to prepare for the BCS title game on Jan. 7, but coach Brian Kelly’s restoration of the Notre Dame mystique could linger much longer. The Golden Dome atop Notre Dame’s administration building has regained its luster at a school where coaches Bob Davie, Tyrone Willingham and Charlie Weis all failed to restore the program to its most recent glory under Lou Holtz in the late 1980s. All told, Notre Dame lost at least three games every season between 1993 and this fall — not bad, but not good enough to contend for national titles. Athletic Director Jack Swarbrick, a Notre Dame alum, said when he took the job in 2008 he found no reason Fighting Irish football could not be great again. “I became convinced there weren’t any insurmountable hurdles, institutional hurdles, something in our approach or our system that made it so we could never be this successful again,” he said in a phone interview Sunday. Just three years after taking over a 6-6 team with ancient expectations annually dwarfed by the modern realities of competing at a Catholic school in frigid northern Indiana with tough academic standards, Kelly has put the Irish back on top. And though he’s still one win shy of ultimate success, Kelly did it in his third year — the same season in which Frank Leahy, Ara Parseghian, Dan Devine and Holtz all won national titles during their tenures at Notre Dame. Thousands of Irish fans turned up at the Coliseum for the regular-season finale, demonstrating the wide reach of Notre Dame’s appeal. The Irish have embraced their status as an international program in recent years, playing everywhere from Yankee Stadium to Dublin, Ireland, while Kelly put the ingredients in place for this season’s success. Swarbrick acknowledges he expected the Irish to need maybe one more year to contend at an elite level. “I knew we were much, much better, but frankly I thought the schedule might mask the progress,” he said. Although Notre Dame’s defense was clearly tough, nobody could have expected such success from an offense now led by the likes of quarterback Everett Golson, who redshirted last year, and tailback Theo Riddick, who was a slot receiver last season. The Irish were nobody’s favorite, but they’ve ended up on top. The 84-year-old Brennan, who was just 25 when he took over the Irish program in 1954, knows all about the importance of seizing the moment. The Irish returned home Sunday knowing they’ve still got a bit of work to do — and if their season to date is any indication, they’re still hungry. Notre Dame is likely to be an underdog to an opponent from the Southeastern Conference in the BCS title game. The Irish will rely on the experience of their unbeaten season, the history of past champions wearing their uniforms, and the support of untold millions who love what the team once represented — and what it means again. Te’o, who turns 22 in January, hadn’t been born the last time Notre Dame won a national title. He still knows the date of the last Irish national championship by heart, thanks to the sign at the end of the tunnel at Notre Dame Stadium where he steps on that hallowed field each game day.